The Mine announces Pop-Up Studio in New York City featuring design trends and luxury collections. We are thrilled to bring The Mine to Chelsea, and to have the opportunity to provide fresh inspiration in a physical space. 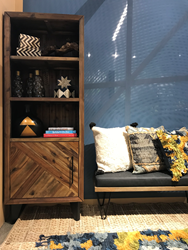 The Mine, a Lowe’s company, is excited to launch “The Mine Pop-Up Studio,” in New York City November 13. The space is located on the first floor of Lowe’s City Center store in Chelsea and will be available throughout the holiday season. The space has been fashioned by The Mine’s talented in-house design team. The Studio unveiling features a stylish living room, an elegant dining room and a gracious bar, all furnished with carefully selected offerings and luxury collections from The Mine. Throughout its run, design consultants will be onsite at the Studio to answer questions about The Mine’s services and to demonstrate their new 3D imagery app, Envisioned. The Mine’s newly-released 3D app uses exclusive technology, which allows users the ability to virtually see pieces in their home, before purchase. The Mine will host designer events for the press, and its Chelsea neighbors, as new lines are unveiled. The Mine Pop-Up Studio will represent design trends across home categories. The stylish collections can also be found on The Mine. The Mine is a premier online destination that makes it easy to get the home you crave by offering every customer exceptional customer care, a unique selection of high-quality home furnishings and fresh inspiration from leading designers around the country. We combine a killer selection in lighting, furniture, decor and more with one-on-one Personal Concierge service to take your design dream from concept to completion. The Mine is operated by Allied Trade Group, LLC, a subsidiary of Lowe's Companies, Inc. All references to the "company" are references to Allied Trade Group, LLC.